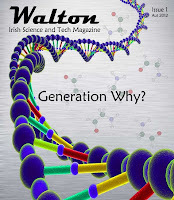 New Irish #SciComm venture Walton Magazine hits the airwaves tonight when they pitch their wares on Dragon's Den. Magazine editor John O'Donoghue and PR Manager Ger O'Donovan braved the den to get funding for their fledgling science communication magazine. The magazine was launched in the Autumn of 2012 and deals with STEM issues from an Irish perspective. My own articles for Walton have dealt with current research on the potato as well as the future of food production and the importance of plant pathology.